DON'T TAKE ANY RISKS WITH YOUR PERSONAL SAFETY. ONLY ATTEMPT TO SERVICE A SATELLITE DISH WITHIN EASY REACH OF THE GROUND, AND EVEN THEN, PLEASE BE CAREFUL. 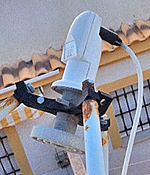 A correspondent tells us that he was able to restore BBC reception on a 120 cm ChannelMaster dish in Santillana del Mar, Cantabria, by simply cleaning it with a jet-wash. The signal is still apparently quite weak but considerably improved. An upgrade to a 1.5 metre is planned, which should bring 24/7 BBC SD and HD. It's worth trying if your dish is obviously dirty. Foliage and anything metal can have a drastic effect on your signal. Trees and bushes may have grown up since the dish was installed, and may now be blocking its view. If your dish is oval, the bottom support arm (but not the dish itself) will be pointing directly at the satellite. If your dish is circular, it will be pointing higher in the sky, directly at Astra 2E. The LNB is the device at the ends of the support arm (or arms) of the dish. Check for cracks in the face. Clean it, if dirty. The "F" connector which attaches the cable to the LNB should have a rubber boot, self-amalgamating tape or at least insulating tape wound round it. Lazy installers don't bother to seal the connection. If there is no protection, in some situations, rain can get into the cable and run down inside your receiver, with some pretty bad consequences. The LNB is a delicate device, which converts microwave satellite signals into lower frequencies, to pass down the cable to your receiver. LNBs don't survive well in hot countries. After five years they are thoroughly "cooked" and should be replaced. Many LNBs have poor sensitivity and rejection of interference. This didn't matter when the signals were strong. It really does matter now. LNBs by Inverto, Invacom and Smart are good. The Inverto Black Ultra, for oval dishes, is generally considered the best for fringe reception. The Invacom QDF-031 is a good match for prime focus dishes, fitted to an Invacom ADF-031. Inverto also make a C120 prime focus LNB. If you have a circular dish and your LNB looks like this, get a new one. The picture left shows a modified Sharp LNB, which is normally used on offset dishes. This one has had the front cut off and a feedhorn glued on. It is likely to have an additional internal feedhorn inside, which reduces efficiency. These worked OK in Spain until a new Middle East satellite at 26º east started broadcasting. 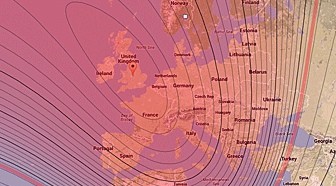 It's very close to Astra 2 at 28.2º east and causes interference, which the Sharp can't handle. If you have one of these, get it replaced immediately. If you have two receivers attached to one dish, and one causes the signal to disappear when you switch it on, replace it. Often, one receiver causes the problem but the other doesn't. It's likely to have a faulty power supply. Another cause can be a short-circuit in one of the cables. A partial short-circuit can reduce signal. Check for strands of outer braid touching the inner conductor. Make sure the dish cable is secure in the plug at the back of your receiver. They sometimes become loose. The first generation of Sky+HD receivers were made by Thomson. They can be identified by the three RCA-type red, green and blue connectors on the back. They are larger than the current Sky+HD boxes, noisy, and virtually guaranteed to fail. The first units died after 18 months of service. Thomson Sky+HD boxes were fitted with cheap capacitors, which overheat and swell. The symptoms are periods of "no satellite signal being received" on even strong channels. This progresses over a period of months to complete failure. The box will then start up but always show "no signal"
If you can be bothered, they can be repaired with a new power supply, but will probably not be able to decode HD channels after the next Sky card re-issue. Some early Sky boxes made by Sony and Pace work badly in fringe areas. Only with the Pace 430n and the excellent Pace 2600CI did things improve. Panasonic's DSB 30 had a good tuner but severe software problems. Pace's later single-tuner 440n and 445n proved surprisingly poor out of the UK when they were introduced. They seemed to have tuners which could not cope with the mix of strong and weak signals found in fringe areas. Humax have some of the best boxes for fringe reception. The Humax Freesat HDR has a very good tuner, as does the original Humax Freesat single tuner model, which is outstanding. If you are suffering from poor reception, try to borrow a Humax Freesat box to see if it performs better than your current receiver, before spending any money. Install a larger dish. If you can get the BBC and ITV for part of the day, this is good news. It means an upgrade of one size should return reception to 24 hours a day, but if you are in Iberia, see our Dish Secrets page first. This could mean moving up from 70 to 80cm, 80 to 90cm, 90 to 100 cm. In larger sizes, jump from 100 cm to 120 cm, 120 cm to 150 cm, 150 cm to 180 cm, 180 cm to 240 cm. Beyond this size, the cost rises exponentially and should only be considered if someone in the same area has already has this size working. Jump two sizes if you want a healthy margin for heavy rain. If you can receive no BBC at any time of day, nor Channel Five in standard definition, then the increase in size needed is impossible to predict. Ask around in your community. There may be no signal at all. In the worst-case scenario, you may need a dish in excess of three to four metres, costing thousands of Euros.